What are dandelion root benefits? 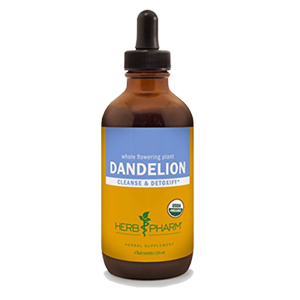 Dandelion (Taraxacum officinale) is one of the most common herbs that grows wild in moderate climates all over the world. 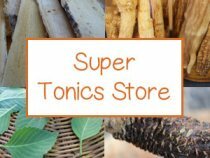 As a cleansing herb, dandelion root and leaves are natural detoxifiers and blood cleansers used by humans for centuries as a remedy for all types of ailments from hepatitis to skin disorders. The Chinese use the greens and roots of dandelions to "cool the blood” and in medieval folklore the entire dandelion plant was seen as an herb of prosperity and protection, honored for its powerful medicinal value and tonifying elements. Dandelion is thought to be native to Europe and the seeds were intentionally brought over to the America's for propagation by the colonists. This wild edible was not viewed as a "weed" in the olden days. It was seen for the beauty of its golden blossoms and was actually encouraged to grow and proliferate. The name comes from the French "dent de lion", meaning lion's tooth, which refers to its jagged, long tooth-shaped leaves. Dandelions are fast growing plants known to take root and thrive in barren habitats. One of the reasons for this is because they are working with natural forces to loosen the soil, pull up nutrients that can potentially fertilize and encourage other plants to grow in otherwise infertile areas. The roots of dandelion run deep into the earth, up to 15 feet, and are hardy masters of survival with the ability to hold quite a bit of moisture in their root system. The use of dandelion root tea has been used by herbalists throughout the ages for its many healing components. 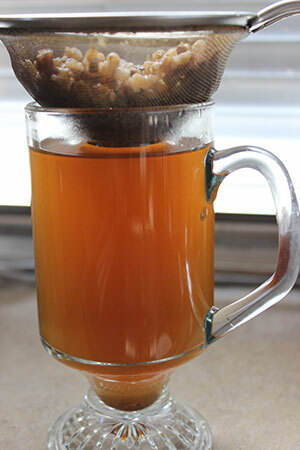 The tea is one of our very favorite herbal teas to make in the springtime. 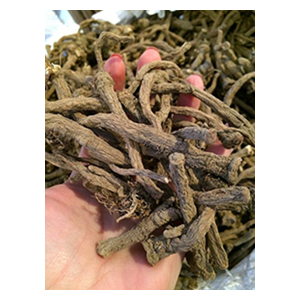 Spring, in Chinese medicine, is the season of the "liver" and a cleansing time of year. This is also when dandelions happen to be popping up in backyards, front lawns, garden spaces, meadows and hillsides. Drinking the tea on a daily basis in the springtime can help to detox the body, purify the blood and is often helpful for those who tend to have pollen allergies or hay fever. 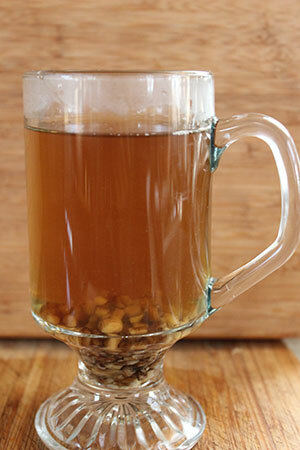 Dandelion root tea can be a great addition to a juice fast for a way to accelerate the cleansing process. 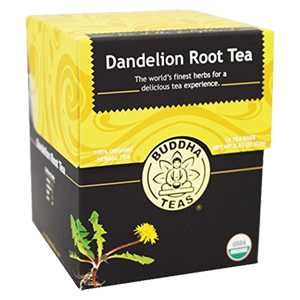 We have been using dandelion root for over 25 years, mostly as a tea by itself, but sometimes we mix it with other herbs in herbal tea formulas. 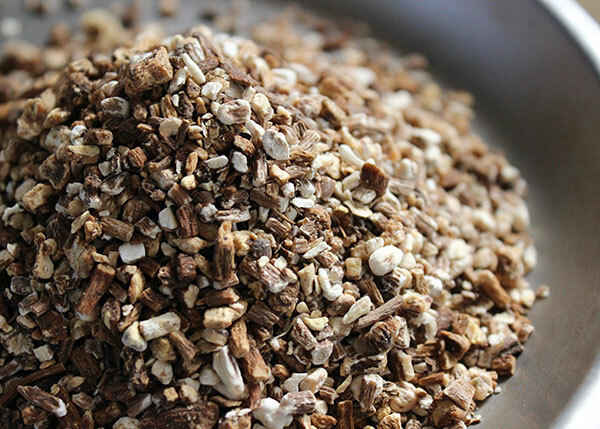 Fresh or dried dandelion root can be decocted (simmered) with tonic herbs as well as infused with nutritive herbs, like red clover blossoms, nettle, oatstraw or horsetail, for additional cleansing actions. Roots, like dandelion, are a very important class of herbs in botanical medicine, called herbal "alteratives." Alteratives are blood purifiers that "alter" the condition of the blood by assimilating nutrients and eliminating metabolic waste products. 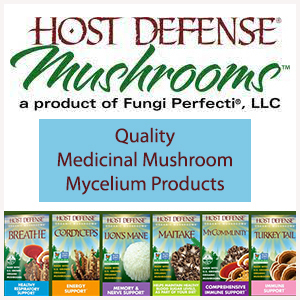 They help to neutralize acidic conditions, aid protein absorption and are very high in nutrient content. As an alterative, they contain bitter principles that activate and stimulate the action of the liver. 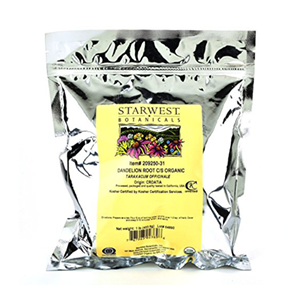 Dandelion root benefits offer mild, gentle nourishment for the liver organ. 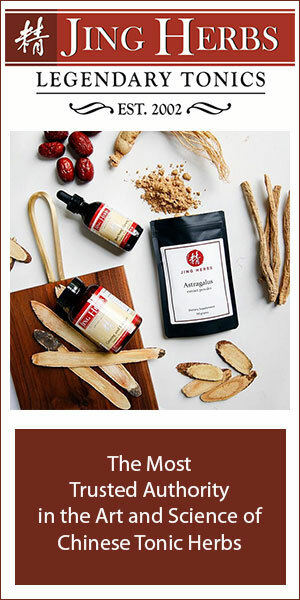 It is one of the top cleansing herbs most commonly used and recommended by herbalists. 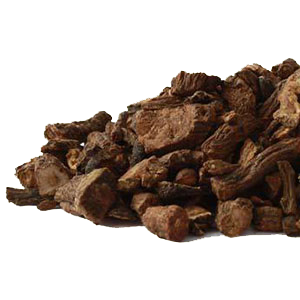 Acts as a mild stimulant to the liver and gall bladder. Neutralizes acids in the blood and helps to counteract excess acid build up in the system. 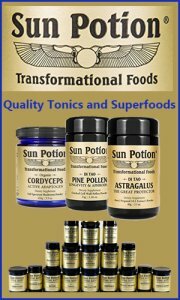 Tonifies by providing minerals, trace elements and various nutrients that are highly nutritious to the body. Astringent nature pulls excess fluids and toxic accumulations out of the liver organ where they tend to concentrate. Helps to eliminate "excess heat" from the liver and is cooling in nature. Bitter components function as digestive aids to stimulate the secretion of gastric juices. The liver is the root of stability for the entire body, when it is functioning at its best so do all other systems and organs of the body. The blood that runs through our veins is like a river system that affects all areas and organ systems of the body. Because the liver is the "master detoxifier" it is largely responsible for the condition of our bloodstream and when we nourish it and keep it healthy our entire body feels the results. 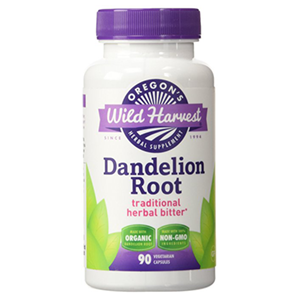 Dandelion root benefits this all-important organ as well as do other liver cleansing herbs such as milk thistle seeds, burdock, yellow dock, Oregon grape root, chaparral, sassafrass bark and echinacea. Dandelion root tea and dandelion greens are known for their bitter quality. The "bitter taste" in Ayurvedic medicine helps to break up congestion in the liver, decrease water retention and sooth/cool itchy skin conditions as well as improve digestion. It is good to include the bitter taste in your diet on a daily basis. This includes eating plenty of green leafy vegetables, like dandelion greens, as well as bitter root teas like dandelion root. In the old days of herbal medicine we would make something called "digestive bitters." This was a liquid tincture with dandelion root and greens as the main ingredient along with other digestive herbs and spices. When taken before meals it helps to stimulate the digestive juices. 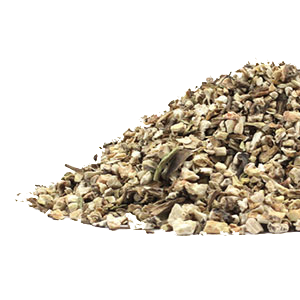 Dandelion root, as it filters excess wastes and poisons from the bloodstream, also improves blood circulation, assists in lowering cholesterol and helps with anemia. 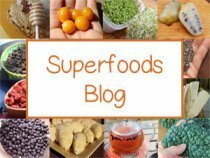 It contains the two flavonoids, apigenin and luteolin, that have been studied to have anti-inflammatory effects that may be helpful for degenerative disorders. Further research on apigenin and luteolin also shows that they have potential antioxidant protecting attributes, according to a study. 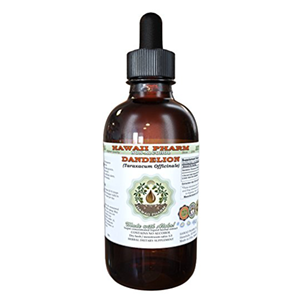 Because dandelion root benefits the liver and causes it to produce more bile, it also simultaneously supports the health of the gall bladder, helping it to release sludge, cholesterol or calcium deposits that may cause gallstones further down the road. Bile is a greenish-yellow fluid needed by the body to digest dietary fats and remove toxins efficiently. 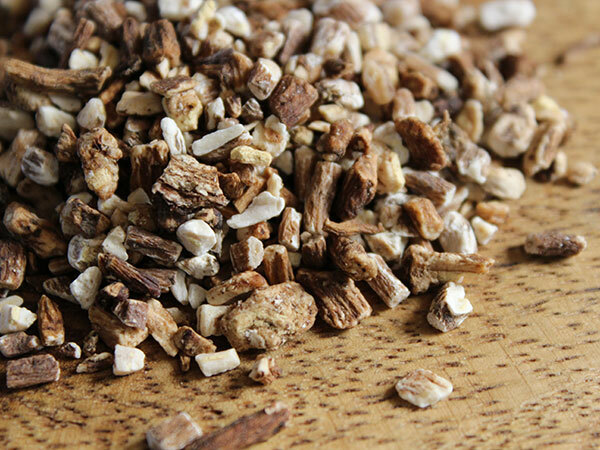 As we mentioned above, dandelion root is a "digestive bitter" that encourages the proper digestion of the foods we eat and is especially helpful for relieving gastrointestinal issues, acting also as a mild laxative. The use of dandelion root tea can be very helpful for clearing up any kind of skin issue. Skin eruptions are directly connected to the liver organ which plays an important role in hormone regulation. When the liver is clean on the inside, the epidermis usually reflects this with vibrant healthy supple skin. Liver herbs, like dandelion are especially good for reducing acne, rashes and more chronic problems like psoriasis. 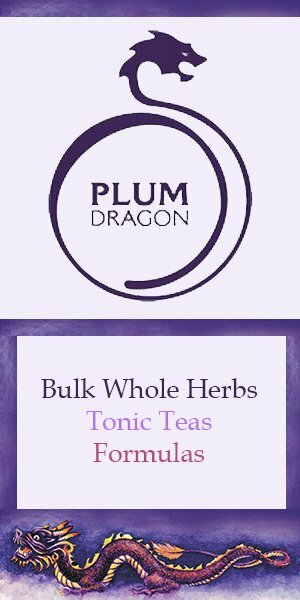 Teas and tinctures with dandelion root, in addition to adhering to a health promoting diet and lifestyle, can be extremely beneficial to the skin when used every day for a period of time. Contains taraxacin (the bitter component) which stimulates the flow of bile and aids in the process of digestion. High in pectin fiber, which can help to lower cholesterol, alleviate constipation, bind to and remove toxins. 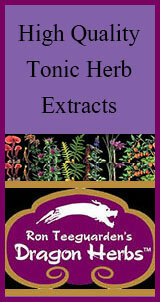 Balances hormone levels with the two compounds taraxasterol and taraxerol, helps to balance menopausal symptoms and PMS. 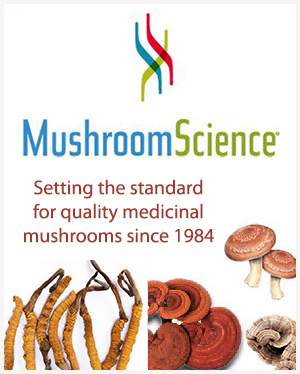 Source of inulin, helpful for diabetics and the balancing of blood sugar levels. Contains chlorogenic acid, which has been shown to inhibit glucose-6-phosphatase, an enzyme that promotes the formation of glucose in the liver. Liver herbs, especially dandelion root, can be very beneficial to those who experience hay fever or allergies caused by the over reaction of the liver to foreign protein bodies. Maintaining a healthy liver is extremely important for individuals with such sensitivities to pollen, dust, chemicals, mold, foods and animal hair. When the liver is in a healthy state it produces an enzyme called histaminase which acts as a natural "antihistamine" to protect against and deactivate these foreign invaders. If the liver is not functioning optimally it cannot produce histaminase. 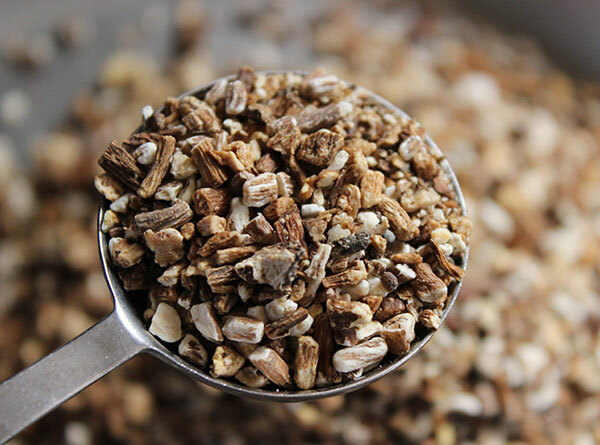 One can, over time, work to tonify and strengthen the liver organ, with herbs like dandelion root, to lessen and eventually eliminate allergies and their uncomfortable side-effects. Dandelion root benefits also as a diuretic. The two flavonoids, apigenin and luteolin, act as a natural diuretic to help remove excess fluid and salt from the body, which has been shown to lower blood pressure and treat a number of health-related problems. Dandelion's astringent nature helps to pull out excess fluids as well as toxic accumulations in the liver organ (where they tend to concentrate) and releases them through the urine. Because the root is high in potassium it is a favorable choice as diuretics are known to leach potassium from the body. The tea can be helpful for those looking to lose weight. Because dandelion root benefits naturally detoxify the liver and body, they also encourage the release of excess body fat. In addition, the bitter components increase bile production which helps to metabolize fat and cholesterol important for weight loss. 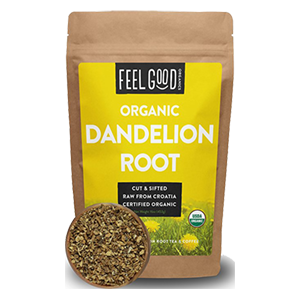 Dandelion root benefits the body to a higher degree when you use quality herbs from a source that you trust. All roots should be organic or harvested from wild regions away from polluted or sprayed areas. 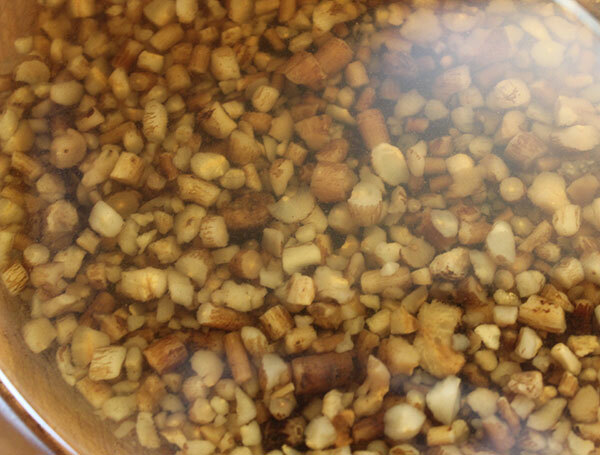 Tea decoctions are made by adding the raw or roasted root to boiling water and simmering on low for at least 20 minutes or longer. You must strain the root out before drinking your tea, which has a delicious, nutty bitter (in a good way) flavor. One of the traditional ways to use dandelion is as a roasted root, usually blended with chicory root and roasted in the oven. This results in a delicious tea that is similar in flavor to that of coffee. In fact, many cultures refer to it as "dandelion coffee." Roasted dandelion can be purchased and is a darker brown color than the raw dried root. Some of its medicinal qualities have been diminished from roasting it, but it still offers some cleansing effects. When the liver organ is backed-up and burdened with waste material we tend to experience emotional states such as irritation and anger. Sometimes, when drinking dandelion root tea, we may feel these emotions surface for short periods of time as the body expels toxins. In addition, liver herbs like dandelion root can stimulate rapid outbreak and elimination through the skin. These "healing crisis" are short lived, however, and are sometimes a necessary part of the cleansing process. 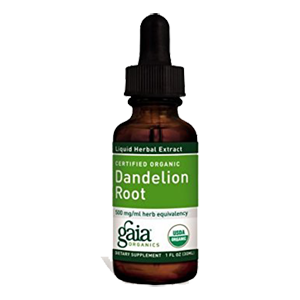 It is also very common to find dandelion root benefits in tincture form or as part of an herbal formula using other liver herbs to make "digestive bitters." To extract the medicinal properties from the roots you must use an 80 proof vodka or other alcohol equivalent. Simply macerate the root with the alcohol in a high speed blender, place in a jar with a lid and store in a dark place for 4-6 weeks. It is always good to label and date your tinctures since they take a bit of time and you may forget about them. 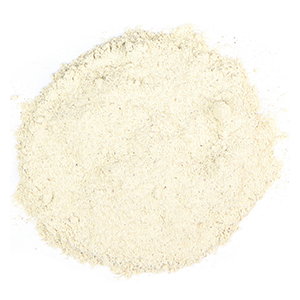 Dandelion root powder can be made or purchased. It is a lot fresher if you make your own by placing the dried dandelion roots in a high speed blender or NutriBullet and grind them into a powder. The powder can be consumed in water, added to hot drinks or blended foods. For greater potency we always recommend decocting or tincturing the root as these processes release more of its medicinal properties. 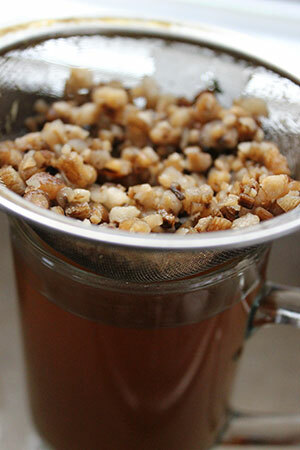 Decoct, or simmer, the dandelion root tea for 20 minutes. 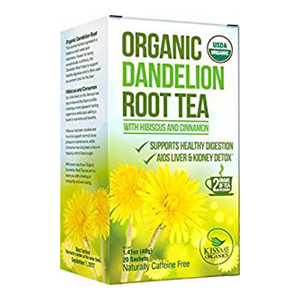 Dr. Oz includes the tea in his weekend cleansing program, "Dandelion Root Tea: Before bed, enjoy a cup of dandelion root tea, an excellent way for your liver to excrete toxins from your body." Decoct the dandelion root, anise and the ginger root in 3 cups of water for 20 minutes. Infuse the other ingredients in a mason jar for another 15 minutes. 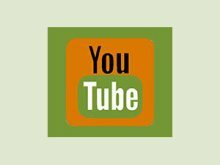 Consult your healthcare provider or physician if pregnant, nursing or if you have a serious medical condition or are taking prescription medications.